Katherine is a British and European Patent Attorney. She obtained a BSc in Molecular Biology with French from the University of Manchester. This included a year carrying out research at the Institut de Génétique Moléculaire in Montpellier, France. She then completed a Masters in Research in Biological Sciences at Manchester, which involved diverse research projects relating to the molecular biology of bone development, the classification of anaerobic fungi, and a study of trypanosomes using RNA interference. Katherine then studied gene expression in the malaria parasite at the National Institute for Medical Research in Mill Hill, London, and was awarded a PhD from the University of London for her thesis entitled “Nuclear genes involved in the maintenance of the malarial plastid”. 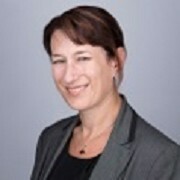 During her time at Williams Powell, Katherine has worked on, amongst other things, the patenting of medical devices, nucleic acid arrays and their use in hybridisation assays, methods of oligonucleotide synthesis, and diagnostic tests and treatments for several important medical conditions and diseases. Out of the office, Katherine is a keen runner and regularly runs and volunteers at her local parkrun® event. She also enjoys being on wheels: she cycles regularly and is currently attempting to master the art of inline skating.